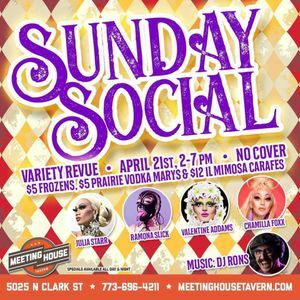 Celebrate the astonishing, the gag-worthy and the glamour at Sunday Social–one of our most popular events–this Sunday starting at 2pm! Chamilla Foxx hosts as DJ Rons mixes a myriad of melodies between rotating, weekly performances! Featured performances this week by Julia Starr, Ramona Slick adnd Valentine Addams. $5 Frozens, $5 Prairie Vodka Marys & $12 1L Mimosa Carafes on special all day & night! And, as always, no cover!